The 2019 Spring Retreat for Ontario Presents members will be held from June 12-14th in Toronto. OP's partnership with Luminato Festival promises our members some very unique and exciting experiences! Key retreat events will take place on Thursday, June 13th and Friday, June 14th. Members arriving on Wednesday evening will have access to Luminato tickets at the arts worker price for that night. The retreat will take place across several venues in Toronto, hosted by both Ontario Presents and the Luminato Festival. We will share further location details shortly. New, lower prices! Full registration includes participation in select Illuminating Works programs, OP Annual General Meeting, lunch and dinner on Thursday and Friday, and a ticket to BIZIINDAN! on Friday night. A block of rooms have been set aside at a group rate at the Novotel Toronto Centre. Room bookings must be made by Wednesday, May 8th. Please contact Ceilidh directly to book your room. 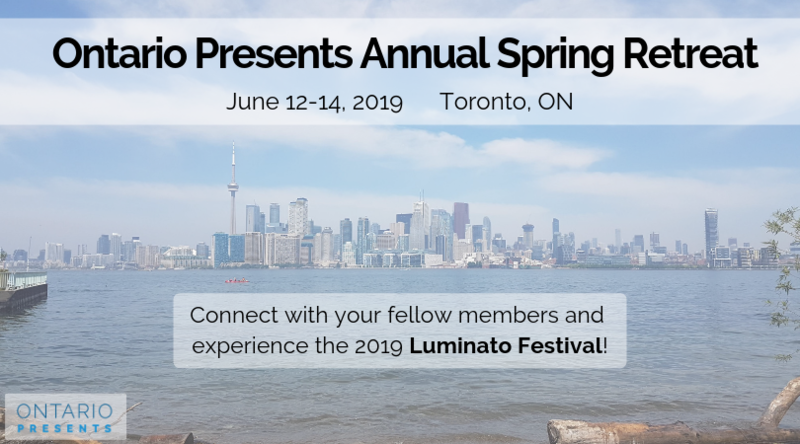 Members are invited to travel to Toronto, connect with colleagues, and attend Luminato performances. Available performances can be found here, discounted tickets (up to 50% off) can be accessed by selecting the "arts worker" price. There will be no official Ontario Presents group activities on this day. Hear from exciting artists through artist pitch sessions, part of Luminato's industry series, Illuminating Works. Continue conversations and make connections at the following Industry Lunch. Then join us for the Ontario Presents Annual General Meeting as we review exciting past year and big plans for the future. Finish the day with a group dinner, followed by option to attend a Luminato show. Available performances can be found here, discounted tickets can be accessed by selecting the "arts worker" price. Start the day with rehearsal visits for two shows in the Luminato lineup, as part of Illuminating Works. In the afternoon, Ontario Presents members will gather together for lunch and an afternoon opportunity to discuss common topics of interest. More details to follow. We will finish the Retreat with a very exciting Luminato event! Following a light dinner, we will attend a pre-show Treaties conversation, followed by BIZIINDAN!, a concert of celebration, featuring voices from across Turtle Island singing their truths. "BIZIINDAN! celebrates the power of music, the reclamation of voice, and the Indigenous global revolutions of past, presents and future." The evening features Marie Gaudet, 2010 Juno Award-winning band Digging Roots, 2017 Polaris Music Prize-winner Lido Piemienta, award-winning legendary artist Pura Fe, and 2018 Polaris Music prize-winner Jeremy Dutcher. Tickets for this highly-anticipated event are included in Retreat registration!